Yesterday when I was waiting at the famous SRP tools junction there was a group of transgenders who were asking for alms. I usually look away as they can be a little pushy and it can be quite uncomfortable in trains but this time I saw one person who approached my car asking for alms. I picked out a 10 rupee note and gave it to the person, the person asked me for a 1 rupee coin. I was confused and said I did not have coins. The person asked the others in the group if they had a rupee to give me. I was confused even more when the person said that the rupee is for me. 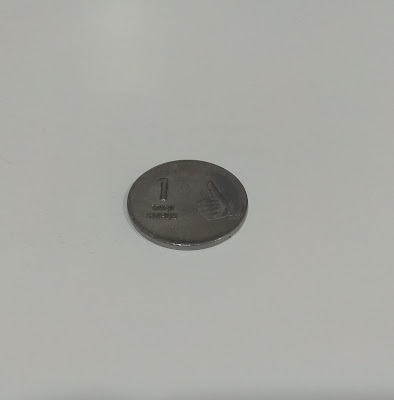 Thoroughly puzzled I found a coin which I handed over. This person bit the coin almost like athletes bite their medals these days and asked to see my wallet. Then the person put the coin in my wallet and said do not spend this and walked away with a blessing that I should live well. - They walked away with a blessing which somehow appeared to be heart felt. These people will not be accepted into the mainstream, surely there can be something that they can do besides asking for alms? What is the significance of this one rupee coin? Why did they bite it? Will I still react with revulsion or fear or disgust when I see these people again? Would I have had the same dignity with which they carried themselves if I was also not an ordinary person?